SPF and DMARC are standards that describe how the origins of email messages should be verified, to prevent email spoofing. I spent some free time over the past few weeks creating checkdmarc , a Python 3 module and command-line interface that can validate and troubleshoot SPF and DMARC records across multiple domains, with the intent of building it into a web application that will process DMARC reports. The Department of Homeland Security recently launched an initiative to deploy SPF, DMARC, and other best practices on most federal agency domains by issuing BOD 18-01. This created the perfect case study of common challenges and mistakes when deploying SPF and DMARC across very large organizations, and even a few small ones. 2018-01-30 update: I have made many improvements to my script, corrected a few of my own misconceptions about DMARC I had in this post, and switched to updated results from 2018-01-28. “Within 30 days of BOD issuance (November 16th, 2017), submit an “Agency Plan of Action” to FNR.BOD@hq.dhs.gov and begin implementing the plan. Configure all internet-facing mail servers to offer STARTTLS. Configure all second-level domains to have valid SPF/DMARC records, with at minimum a DMARC policy of “p=none” and at least one address defined as a recipient of aggregate and/or failure reports. Ensure all publicly accessible Federal websites and web services provide service through a secure connection (HTTPS-only, with HSTS). Identify agency second-level domains that can be HSTS preloaded, and provide a list to DHS at FNR.BOD@hq.dhs.gov. Disable SSLv2 and SSLv3 on web and mail servers. Disable 3DES and RC4 ciphers on web and mail servers. Within 15 days of the establishment of a centralized NCCIC reporting location, add DHS as a recipient of DMARC aggregate reports. Unfortunately, Intelligence Community and/or National Security systems are not required to comply with BODs, although they would still benefit from applying them. 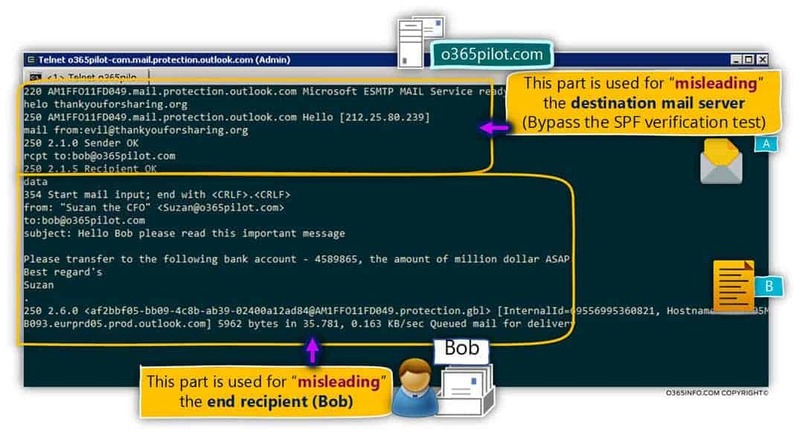 Enabiling STARTTLS on mail servers allows senders to establish an encrypted connection before sending email. Enabling HTS on a web server tells clients to only use an encrypted (HTTPS) connection whenever they are accessing the site in the future. Disabling obsolete, weak cypher suites prevents easy exploits such as POODLE from working. SPF and DMARC are standards that work in tandem to prevent email spoofing. This blog post will focus on these standards. However, all of the best practices are key parts of defense in depth. Emails are spoofed when the from field of the message appears to be from someone other than the actual sender. For example, an attacker sending a phishing email can set the from address to match the target’s CEO. In many organizations, the target’s mail client will even helpfully display a known email address as a name and picture from their internal profile, which makes the phishing email look more legitimate. Spoofing is a powerful, simple tool for attackers, but there are legitimate reasons for spoofing email from addresses. If an organization is using an outside email marketing service, helpdesk, or any other outside service that sends email, there is a need to make the items appear they are coming from their trusted domain, and not the third party, so recipients know who is responsible for the messages. So how can a recipient mail server differentiate from legitimate and illegitimate spoofing? SPF, DKIM, and DMARC, of course! The Sender Policy Framework (SPF) is a standard for listing mail servers that are authorized to send email from your domain. It is defined in RFC 7208. The domain owner publishes a specially formatted TXT record in the DNS zone containing a list of authorized servers. Details about the exact record format can be found here. Also, It is up the receiving mail server to decide what to do with an email if the SPF check fails. SPF does not specify an action for the recipient mail server to take in the event of a validation failure. DMARC fills these gaps, and more. An attacker can still spoof email to make it look as if it is coming from a domain even if it doesn’t have MX records and/or you don’t use it for email at all; these domains are the easiest to deploy SPF on: just add a TXT record containing "v=spf1 -all"
There are multiple mechanisms to allow a server, but a server only needs to be allowed by one of them. For example, if you use the ipv4 mechanism to state that a whole netblock is allowed allowed to send email, you don’t need to use an a mechanism to include a sever by hostname. If you have sending server IP addresses that won’t change often, consider using ipv4 or ipv6 mechanisms, which don’t trigger DNS lookups, instead of mx or a. Have third party services send emails from dedicated subdomains; for example, if a billing services vendor currently sends emails as noreply@yourdomain.com, have them send from noreply@billing.yourdomain.com, and make that email address an alias if you want to receive replies at noreply@yourdomain.com; this way billing.yourdomain.com gets its own SPF record and limits. Having MX records for these subdomains improves en emails trustworthiness to many gateways, even if you don’t actually have mailboxes for that subdomain. DKIM is a stronger method of validating that an email was sent from an authorized server than SPF. The sending server signs outgoing mail with a private key, and places the signature in a message header and the receiving server validates the signature using a public key published in DNS, as defined in RFC 6376 – DomainKeys Identified Mail (DKIM) Signatures. Messages may have multiple DKIM signature headers if they have been forwarded through multiple gateways. A verifier queries the TXT resource record type of brisbane._domainkey.example.net. Here, example.net is the author domain to be verified against (in the d tag), brisbane is a selector given in the s tag, and _domainkey is a fixed part of the protocol. DMARC is the Domain-based Message Authentication, Reporting, and Conformance standard, as described in RFC 7489. It consists of a specially-formatted DNS TXT resource record published by a Domain Owner, that tells mail servers what to do when they encounter a message that appears to be from that domain, but fails SPF and/or DKIM. It also provides methods for mail receivers to notify Domain Owners when mail fails the DMARC check. DMARC records are TXT resource records of a subdomain of a second-level domain called _dmarc, i.e. _dmarc.example.com. Unlike SPF, DMARC options apply to all subdomains, under the base domain (i.e. example.com). DMARC records are composed of tags and values that are joined by =, and delimited by ;. 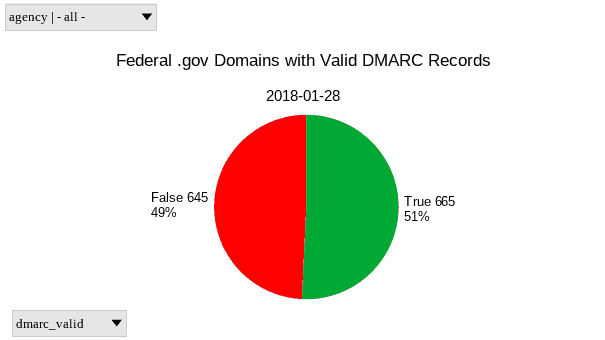 All DMARC records start with v=DMARC1. The most important and commonly used DMARC tags are p, sp, pct, rua, and ruf. none The Domain Owner requests no specific action be taken regarding delivery of messages. This is the implicit default policy. quarantine The Domain Owner wishes to have email that fails the DMARC mechanism check be treated by Mail Receivers as suspicious. Depending on the capabilities of the Mail Receiver, this can mean “place into spam folder”, “scrutinize with additional intensity”, and/or “flag as suspicious”. reject The Domain Owner wishes for Mail Receivers to reject email that fails the DMARC mechanism check. Rejection should occur during the SMTP transaction. The pct tag value is an integer percentage of messages from the Domain Owner’s mail stream to which the DMARC policy is to be applied. However, this must not be applied to the DMARC-generated reports, all of which must be sent and received unhindered. The purpose of the pct tag is to allow Domain Owners to enact a slow rollout of enforcement of the DMARC mechanism. The implicit default value is 100. I strongly recommend leaving pct set at 100 (ideally by not setting it at all), and using the policies to slow the rollout of DMARC instead. That way, the same policy is applied to all mail, not an arbitrary percentage. The rua tag specifies comma-separated delivery locations for aggregate reports, which are typically daily emailed reports of compressed XML files that describe how many emails a Receiver observed from a given mail server IP address that failed the DMARC check. The ruf tag specifies comma-separated delivery locations for forensic reports, which are emails with copies of the original emails that failed the DMARC check attached. These are particularly useful for allowing Domain Owners to examine phishing emails sent third parties as well as their own organization, that were made took look like they came from their domain. However, many Receivers only send aggregate reports, if they send DMARC reports at all; others may only provide the email headers, and not the full content. Both rua and ruf tags are expected to have a value of a list of comma-separated DMARC URIs, the only URI type currently supported in the DMARC specification is mailto. Each email address in the list must be prefixed with mailto: in order to be a valid DMARC URI. _dmarc.example.net TXT "v=DMARC1; p=none; rua=mailto:dmarc@mail.example.com"
_dmarc.example.com TXT "v=DMARC1; p=none; rua=mailto:example@rua.agauri.com ruf=mailto:example@ref.agari.com"
_dmarc.totallylegit.com TXT "v=DMARC1; p=none; rua=mailto:dmarc@mail.example.com; ruf=mailto:dmarc@mail.example.com"
And sending a ton of emails as totallylegit.com that purposefully fail the DMARC check to many different organizations. Return Path has an great series of blog posts of how to read DMARC reports. Check it out once you start getting reports. Passing a DMARC check requires passing SPF or DKIM checks, but DMARC goes beyond by also requiring that the identifiers for at least one of these checks are aligned, so spoofing is prevented. You must sign outgoing email at your gateway with a unique DKIM key before publishing a DMARC policy oa DMARC quarantine or reject policy. Simply allowing a sending server via SPF in not enough. Why? Forwarded emails. Not the kinds of forwards that users send from their mail clients or webmail, but the forwards from mailbox rules. These forwards take place during SMTP delivery, and are common when someone changes addresses, or when a company gets acquired. When forwards happen at the SMTP level, the envelope mail from will not match the header from, so the SPF indicators are not aligned, and the DMARC check will fail, unless the original sending mail server signed the message with DKIM, and the forwarding server(s) did not tamper with it. DKIM signatures are included in forwarded messages, because they are in the message headers. 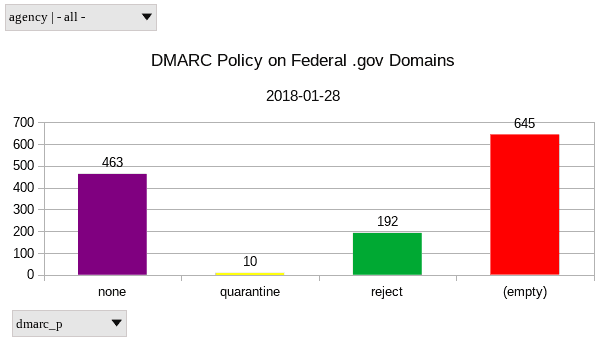 I made some improvements to my scripts, and reran the tests on 2018-01-28 to see how the federal government had improved, now that the deadline to at least have a p=none DMARC policy had passed. Unfortunately, due to the bug fixes I’ve made in between tests, the results are not comparable, but these results are more accurate. The generated files can be downloaded here. gsa.gov General Services Agency Uses 13/10 DNS lookups pct value is less than 100. This leads to inconsistent and unpredictable policy enforcement. Some very significant agencies are missing from the list above, because they are members of the Intelligence Community (IC). DHS Binding Operational Directives do not apply to IC and/or National Security systems. However, SPF and DMARC would still be great security controls for them to deploy, as they are much more likely to be targets of spoofed phishing email than other agencies. At the very least, it could provide counterintelligence on phishing attempts sent to Unclassified email systems, because nothing like that has ever happened before. So, let’s check on the deployment of SPF and DMARC in the IC too. Shout out to the FBI for still being the only IC member with a DMARC policy currently set to reject! Let’s check the major defense contractors for comparison. I also threw in Leidos, a spin-off of Lockheed Martian that provides information security consulting services to a variety of industries, and SpaceX, to see how newer, companies compare to the established giants. Several of these companies have separate domains for their email and web services. 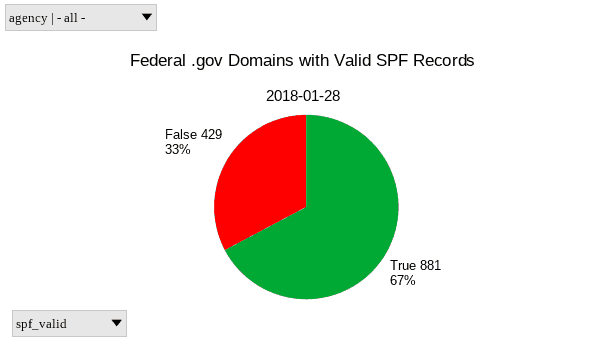 The email domains are protected by SPF and DMARC, but the web domains are not. Although those web domains do not host email services, those domains could still be useful to spoof for phishing. Sean Whalen is an Information Security Engineer in the healthcare industry, and founder of the InfoSec Speakeasy, specializing in intelligence and malware analysis. Previously, he worked as an intelligence analyst in the defense industry. He has a passion for open source software, and sci-fi. Great post! Very interested in seeing update since Jan 15 BOD 18-01 deadline for DMARC records & aggregate reporting. Could you shoot me an email....would like to discuss this further with you. Thanks! Informative. I'm trying to setup my own policies and learned from it. Thank you. Would you please post an update page to your blog so we can see the results to date. It is almost a year later, and it would be useful to see how the effort to implement DHS Binding Operational Directive 18-01 (BOD 18-01) is going.